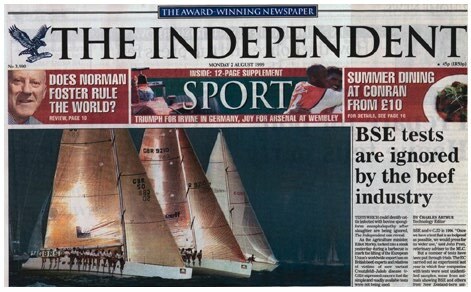 Evergreen IRC 50: Gold Roman Bowl winner and top big boat Commodores Cup ’02, now winning in Asia. 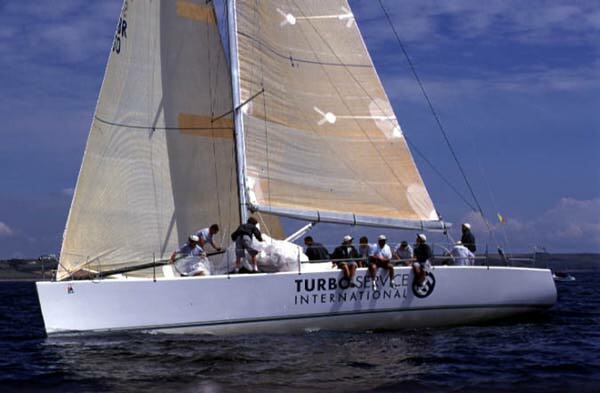 The Mills Design 50′ Mandrake emerged from the 2002 Commodores Cup as the top Big Boat for the event, beating three Farr 52’s in light and shifty conditions. Her success is a testament not only to the excellent crew but to the commitment to keeping the boat up to speed shown by her experienced owner Peter Morton. She arrived for the 2002 season with a new carbon swept spreader mast from Formula Spars (see below), which increased her spinnaker area by almost 40%, ensuring a better all-around performance profile relative to the original alloy IOR rig. Her increased pace offwind, especially in the light has complemented her excellent upwind speed, and the simplified rig with 2 swept spreaders and no runners or checks has made her more competitive than ever under IRC, extending her winning lifespan. When Peter Morton phoned in May 1999 and described what he wanted, and how long there was to complete it, it was clear that a great opportunity was available to pull off something special. A huge coup for Mills Design to be selected by such a prominent owner (his Grand Prix IMS 50 Venture 99 for the 1999 British Admirals Cup Team was being completed only a mile from the Elephant Boatyard where Mandrake took shape), and a chance for us to climb up the learning curve into true Big Boat territory. Morton had an older IOR 50 Mandrake which was in beautiful condition but by now an objectively slow boat. He wanted to use all the outstanding high tech gear, titanium parts, light alloy rig, carbon rudder, carbon/nomex deck etc, and put a new hull underneath with a minimum of delay and even less expense! The unusual stability and refinement of the IOR 50 footers meant that the recycled parts needed remarkably little modification to suit a new IRC/IRM design. 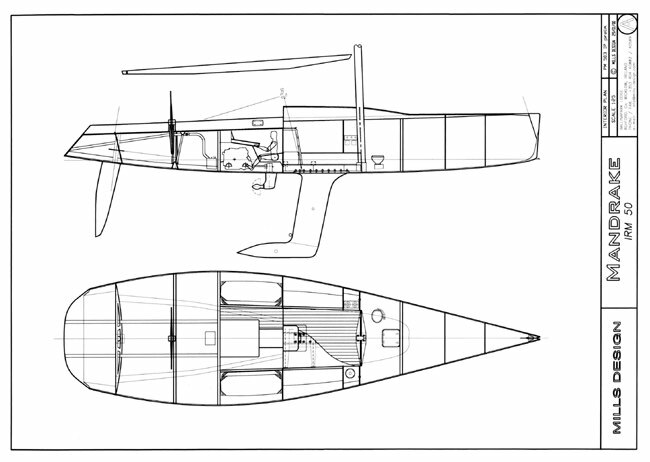 Design work began in mid May, and she was racing in Cowes Week in the first week of August, the first IRM inspired design ever. Mandrake was launched and went for her first sail two days before her maiden event, to provide the new rule with an exhilarating test bed and showpiece. The mid-tech hull was built using a novel foam and cedar core method. At the beginning of the project Richard Faulkner, co-builder of the boat with the Elephant Boatyard suggested a cedar strip hull under the waterline, with the flat topsides laid up in foam sandwich. The cedar is very fast to lay, and the flat topsides accepted the foam panels with minimal need for shaping. With engineering for this new and untried method from John Fox the plan went smoothly, and the hull was finished in record time. It combines with the high tech deck and bulkheads to create a very stiff structure with minimal compromise. The designs light displacement allied with high stability is a potent combination for high performance. The hull shape combines fine waterlines forwards for speed in waves with balanced sections aft for offwind speed. By keeping the waterline beam to a minimum and using rounded sections both wavemaking and frictional resistance is lowered making for a yacht with strong all-around performance. The large bulb on a laminar flow fin assures high stability as the boat heels offering excellent performance upwind as well making full use of the long waterline length. 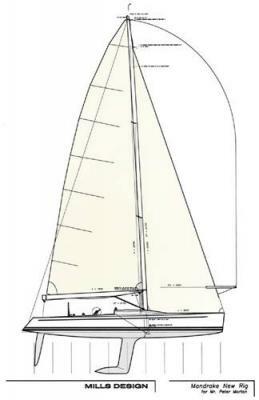 She proved to be a precursor to the Transpac 52 class with her light displacement, small aft overhang, narrow waterline beam allied with a large deep bulb, 2 swept spreader carbon rig with masthead kites, and her small coachroof/long cockpit deck plan. 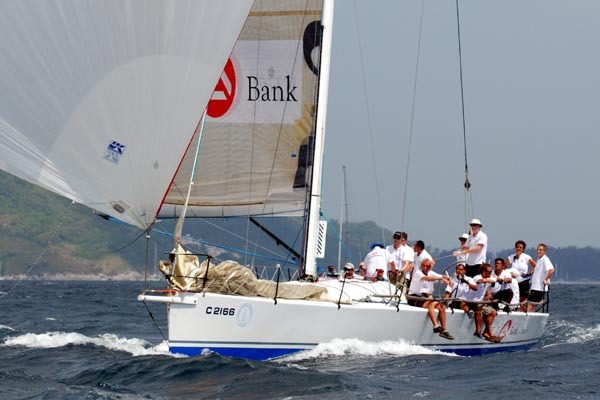 After a very competitive run at Kings Cup in 2002 she was sold to Hong Kong where another upgrade has prepared her to be a very strong IRC performer in the medium/light airs of Asia.